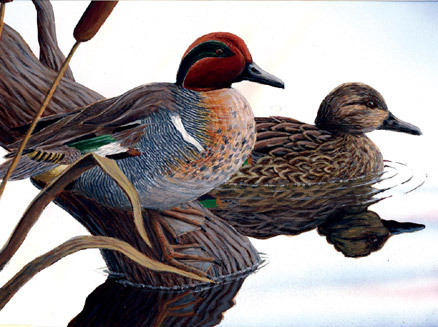 An acrylic painting of a green-winged teal pair won first place in the Federal Junior Duck Stamp Design Contest held April 26 at Ocean City, Md. The annual contest is sponsored by the U.S. Fish and Wildlife Service. This year's top three finishers are shown below in Figure 1. This year's winner was submitted by 18-year-old Nathan Bauman of Jonestown, Pa. His acrylic was judged the top painting among the winners from 50 states, the District of Columbia and American Samoa. Bauman's painting will become 2003-04 Federal Junior Duck Stamp, which the Fish and Wildlife Service's Federal Duck Stamp Office makes available to stamp collectors and conservationists. The stamps are available for the face value of $5 each, and go on sale with the U.S. duck stamp on July 1. Proceeds from sales are used to support participants in the program and a scholarship for contest winners. "The Federal Junior Duck Stamp program helps foster a conservation ethic in America's youth," said Service Director Steve Williams. "By combining the arts and wildlife conservation into one curriculum, students learn about wildlife management principles as well as the aesthetic qualities of wildlife and nature." 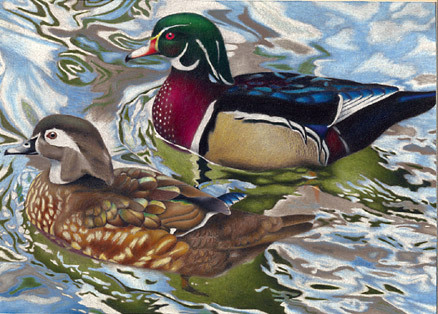 Colby Brandt of Sealy, Texas, took second place with a colored pencil work called "Woodies," a depiction of a pair of wood ducks. 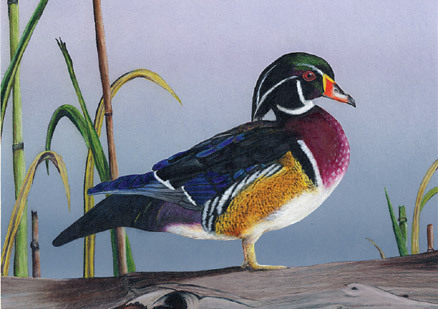 Third place went to Amanda Edsall, age 17, of Canton, Ill., for her rendition of a wood duck. The contest is the culmination of a year-long conservation curriculum used by educators in their classrooms. Each state hosts competitions where Junior Duck Stamp design entries are judged by a group of people active in the wildlife art or conservation community. Each state's winners are sent to Washington, D.C., where a panel of five judges chooses the top three paintings. The Junior Duck Stamp Contest winner receives a free trip to Washington, with a teacher, parent and state coordinator the following November to be honored at the contest. The first-place winner also receives a $4,000 scholarship award. For the better part of 10 years, Scott catalogs have listed prices for stamps graded as "very fine." That value reflected the editor's opinions for a stamp with better-than-normal centering, in a middle range grade between "good" and "superb." Collectors were left to guess the value of a stamp in a better or a lesser grade. Professional Stamp Experts (PSE) recently began issuing a quarterly value guide that expands pricing to seven grades, and displays photos of the stamps in the various grades. Shown at right are two duck stamp images, a 1938 $1 stamp rated as "VF / Grade 80" and a 1956 $2 stamp evaluated by PSE as "Superb / Grade 98." PSE also grades as part of its expertizing service. For a fee, PSE will give an opinion of the grade of a submitted stamp. Scott followed with the first edition of a semi-annual Valuing Supplement, much like the PSE guide, but larger, and with a slightly different set of grades - six, compared to seven by PSE. Scott has a grade of fine-to-very-fine that PSE doesn't offer, and PSE has a grade of extremely-fine-to-superb that Scott doesn't offer. Both guides offer a range of values for early U.S. stamps and all federal duck stamps. The Scott guide assumes a fault-free stamp, but the PSE offers a chart of variable values for grading and soundness. A comparison of the value guides for the first federal duck stamp of 1934 (Minkus RH1 / Scott RW1) appears below. A huge surprise to me was the value given for a complete mint set of federal duck stamps. Scott lists it at $6,426 and PSE at $5,600. And the values listed for a never-hinged set in the top grade of Superb really raised my eyebrows - $13,596 according to Scott, and $14,500 according to PSE. Until I saw this, I would have figured a superb set at about $8,500. However, few stamps qualify for the rigorous PSE grade of 98 that is PSE's standard for a superb stamp. I find PSE grading to be fair, but most stamps graded by sellers as "superb" would not come close to qualifying, particularly in public offerings as on eBay. Which guide is best? Both have advantages. For example, PSE actually certifies grades on its certificates. Scott does not. However, Scott's VF values are identical to those in its catalogs, which are the ones most widely used by U.S. auction houses. The values coincide with the VF grade listed in the Valuing Supplement, and extra-polate higher and lower estimates from the prime VF grade, so there is a consistency. Either publication is a welcome reference enabling collectors and dealers to form a common pricing benchmark for a specific grade. Not to have one or the other in your possession is to fly blind. Both guides have clear photos of each grade to help apply valuing estimates. This product was long overdue and should be a great help to buyers and sellers. The first-day ceremony for the 2003-04 U.S. duck stamp will be held July 1 at 10 a.m. in the National Postal Museum's atrium. The new duck stamp, featuring the portrait of snow geese in Figure 3 by wildlife artist Ron Louque, will be available for purchase, and after the ceremony, Louque and other honored guests will autograph stamps, programs and covers.If you're able to attend, mark your calendar now for this popular event.